I am a long-time resident of Columbia. Recently retired from many years teaching American and Women’s History, I have enjoyed art since my parents first provided me with crayons, paper and paints as a little girl growing up in Ohio. I have always been enamored of the Impressionist painters and try to capture that sense of light and color in my work. 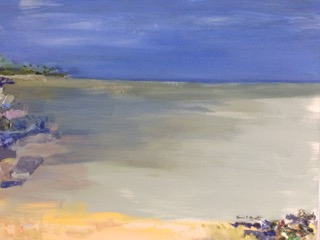 My seascapes and landscapes have been inspired by summers spent in northern Michigan and visits to the coast of Maine. I play the flute and piano and have rendered my flute in a variety of media - watercolor, pencil, lithographs and pen and ink. I have taken classes at the Cleveland Institute of Art and studied privately with Sandy Diamond in Cleveland in addition to workshops in drawing, Japanese woodblock printing, lithography, watercolor and acrylic as a student at the Interlochen Arts Academy in Michigan and later at the University of Missouri, Columbia. 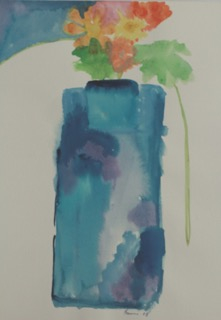 I am delighted to have the time and space in my home to pursue art more fully and enjoy experimenting in mixed media. I am a member of the Columbia Art League and the Mid-Missouri Arts Alliance of Ashland, MO.